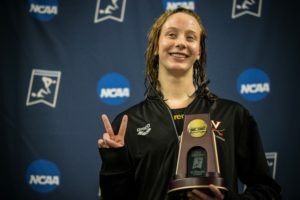 Though Lilly King is not the only American Record holder swimming at the 2019 NCAA Championships, she is the only individual World Record holder at the meet. She is the fastest-ever swimmer in the 100 breaststroke in long course meters and short course yards, as well as the three-time defending champion in this event (and the 200 breaststroke). As King continues to break barriers and delve into the 55s, fans will be left to wonder what other records she may break this summer. To put things into perspective, King’s American Record performance at the 2018 B1G Championships is akin to a World Record performance at the National Championships, or other qualifying meet prior the World Championships: it’s not necessarily uncommon, but we all know that meet is not the athlete’s main focus. 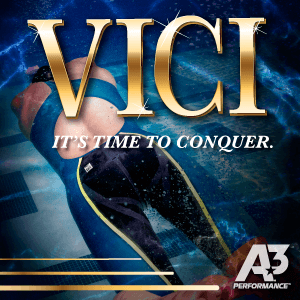 With that in mind, the 100 breaststroke will, in essence, be King versus the clock. With King’s 55-second performance, as well as her slew of 56-second swims, it’s easy to lose track of how significant it is for other women to swim 57-anything in the 100 breaststroke, though this year’s field boasts four women other than King that have done so. NC State freshman Sophie Hansson has been 57 twice this season and enters the meet as the second-fastest competitor with a 57.74 from the 2019 ACC Championships. Hansson established herself as the second-fastest freshman ever in the 100 breast behind King in both prelims and finals at ACCs, and alongside King and Texas A&M’s Anna Belousova, is one of only three swimmers sub-58 so far this season. Belousova swam a 57.99 at the 2019 SEC Championships, shaving nearly half-a-second from her 2018 best of 58.40. 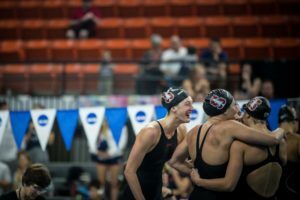 At the 2018 NCAA Championships, Belousova added to her seed time, yet still managed to place 5th in finals behind a slew of Big Ten swimmers. The reigning SEC Champion in this event, Belousova will try and hold off SEC rival Nikol Popov from Tennessee. Tennessee Volunteer Nikol Popov is the fastest 58-second seed in the field, and a thrilling racer with incredible turnover speed. From a strategic and technical standpoint, Popov represents an interesting contrast to Wenger’s race strategy, in that where Wenger works the underwater pullout to great advantage, Popov has experimented with skipping the underwater pullout and surfacing almost immediately. 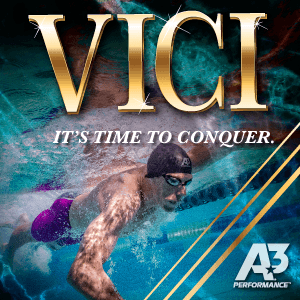 Whether Popov utilizes this strategy again or opts for the more traditional three-part breaststroke pullout will no doubt be a point of interest for fans between now and Friday’s 100 breaststroke. Minnesota’s Lindsey Kozelsky is another sub-58 to watch, and she enters the competition seeded 8th with a 58.70. Last March, Kozelsky placed third in the 100 breaststroke behind King and Michigan’s Miranda Tucker, though she failed to replicate her best time of 57.91 from the 2018 B1G Championships in that race. At this year’s B1G Championships, the trio of King, Tucker, and Kozelsky placed 1-2-3 in the 100 breast, and then King and Tucker again went 1-2 in the 200 breast. 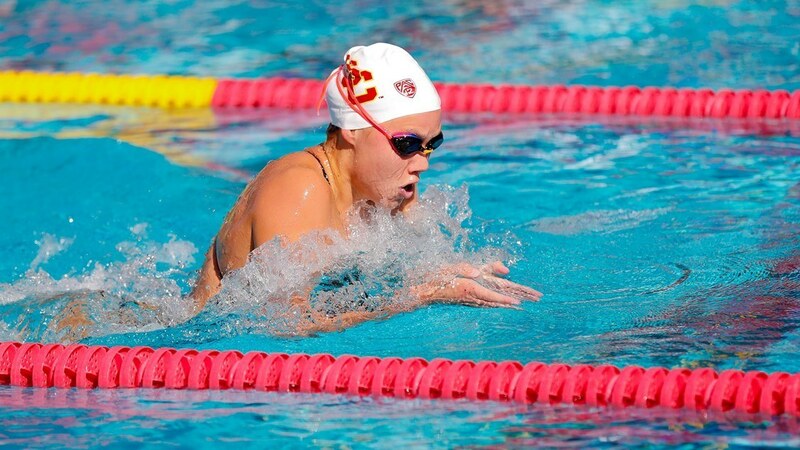 At the 2018 USA Swimming National Championships (LCM), Tucker placed 9th in the 100 breaststroke, though of the 8 swimmers who competed in the ‘A’ final, only King and USC’s Riley Scott will be racing at this year’s NCAA Championships. Southern California senior Riley Scott has a lifetime best of 58.64 from December 2017, though at the 2018 NCAA Championships Scott missed the ‘A’ final and placed 9th in 59.23. At last year’s summer nationals, Scott managed eight-place finishes in both the 100 and 200 meter breaststrokes. 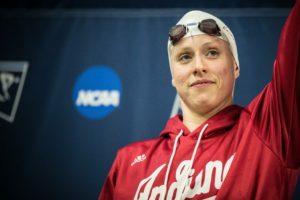 Scott is seeded 14th going into this year’s competition, but her formidable lifetime best as well as her success in the long course pool suggest she could surprise with an ‘A’ final appearance at her final NCAAs. Virginia freshman Alexis Wenger experienced her first time drop since age 14 at the 2019 ACC Championships, where she utilized incredible underwaters to blast an eye-popping 58.31. Prior to ACCs, Wenger’s best time was a 1:00.02 from 2015. In prelims, Wenger posted a respectable 59.70, which she then demolished in finals with a 58.31, taking second to NC State’s Hansson. If Wenger can go 58-low or better, she will almost certainly make the ‘A’ final. 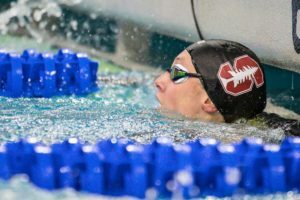 Stanford freshman Zoe Bartel enters the meet with an unremarkable 37th-seed time of 59.92, though her best time stands at 58.72, posted at the 2018 PN Speedo Sectionals in Federal Way. While the top 13 seeds this year enter the meet with season bests that would have been fast enough to make the ‘A’ final in 2018, if Bartel is near or better than her lifetime best, she could earn herself a second swim, and potentially a spot in the ‘A’ final. Florida State’s Ida Hulkko, currently seeded 9th, is another that could slip into the ‘A’ final if she can go sub-59 in morning prelims. At the 2019 ACC Championships, Hulkko placed third in the 100 breast behind Hansson and Wenger with a 58.94. Though the field overall is much faster than last year, it is worth remembering that 59.34 was all it took to make the ‘A’ final at the 2018 NCAA Championships. 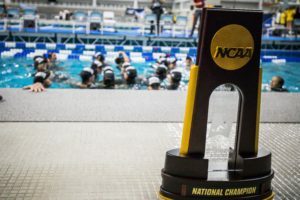 You can find all of SwimSwam’s 2019 Women’s NCAA previews here. Really gonna leave Delaney Duncan out of this… presumably because she comes from a Mid-Major?